Ready for another flower pattern? 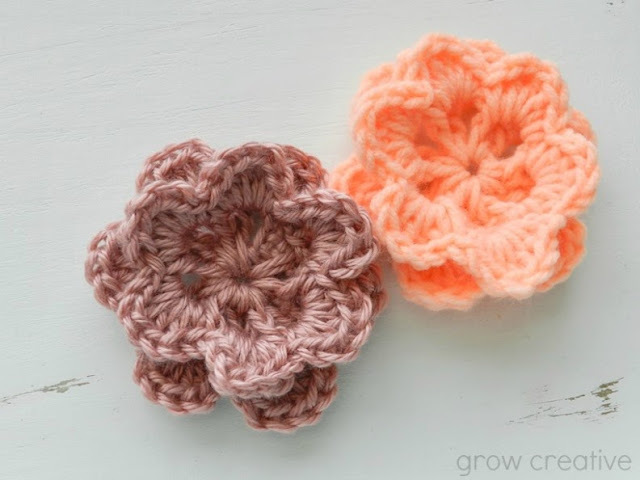 Yes, I know I've done a few before, but I finally created a good flower to go with my Shell Stitch Hats. I've had a few questions about the flower I used for the hat pattern. Well, now my pattern includes the flower with it so you don't have to go elsewhere! Nice! You can check out the Updated Shell Stitch Hat Pattern with Flower in PDF. Ch 5, sl st to 1st ch to form ring. Rnd 1: Ch 7 (counts as dc, ch-4 sp), [ 2dc in ring, ch 4] 5 times, dc in ring, sl st in 3rd ch of beg. Ch 7, do not turn -12dc. Rnd 2: [Sl st, sc, hdc, 4dc, hdc, sc, sl st] in each ch-sp around- 30dc. Thank you! I love the look of your two layered flower and can not wait to try it out! Thank you . . . I am a beginner and I have only done chain, single and double . . . except for one stitch that I created (that probably already has a name, but I don't know it). LOL I just needed something to create a scalloped boarder. Anyway, I've copied your pattern and I'm going to get out my beginner book and give it a try. Thank you again, I was wanting a flower. Best wishes!I'm your new fowoller! OOOOh, I love a new flower pattern, it feels like crochet was invented to make flowers! Thank you, I'll try it out tonight.